Where did Israel disappear to?? It’s such a tiny little country, not much bigger than the awesome state of New Jersey where I am from originally. It is disproportionately prosperous when compared with its neighbors, and only wants to live and exist in peace. Israel stands as the only beacon of democracy and freedom in all of the Middle East. So why on earth would publishing giant Harper Collins decide to remove the name of Israel from it’s world atlas? Because they don’t want to offend Muslims. 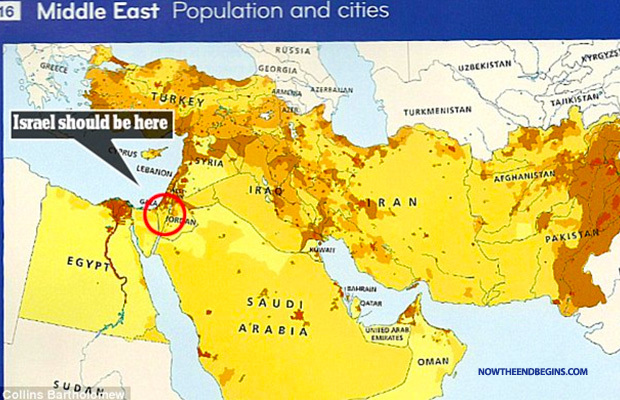 Israel is not labelled on the map – bought by English-speaking schools in the majority-Muslim Gulf, while Gaza and Jordan are clearly marked. Collins Bartholomew, the subsidiary of HarperCollins, told The Tablet that including Israel would have been ‘unacceptable’ to their customers in the Gulf and the amendment incorporated ‘local preferences’. Israel is hated by most of the world because it is God’s holy land, (the only holy land on the face of the earth), and the Jews remain God’s chosen people as the bible declares. Because of that we see time and again covert and overt acts of antisemitism against God’s people, and it will only get worse as these last days continue to gather in speed and intensity. Harper Collins has done more than simply removed a name to appease Muslims. By removing the name of Israel from their atlas, they boldly declare their belief that Israel does not have the right to exist and that they agree Israel should be literally “wiped off the map” like Iran constantly reaffirms. Removing Israel from the map is more than just antisemitism, it’s also terrorism.